Since this article was published, Price Drop has ceased broadcasting. The article has been left here for reference purposes. 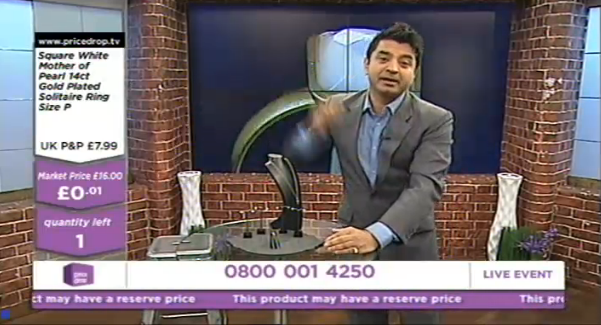 Shopping channel price drop has relaunched this morning with a new format and new 0800 freephone number. Falling price auctions start at a "market price". The price continues to drop through the auction, but some auctions may have a reserve price. If the price falls below the reserve price because the entire quantity has not been sold, the auction closes. Viewers who haven't purchased by that point are locked out, and viewers who have made a bid for the product on sale lose. The channel is on air from 07:45 through to 01:00, according to programme listings. During March, the channel had been split, with price drop's spring clearance running until 6pm and 'best of bid' taking over at 6pm. Owners sit-up Ltd recently avoided going out of business after creditors agreed to a Company Voluntary Agreement. At the beginning of the week, bid and price drop changed their distribution on Freeview, in a move thought to be in connection with reducing Freeview carriage costs. On Freeview, price drop now broadcasts on a new frequency, via multiplex COM7 alongside BBC Four HD and Al Jazeera HD. Although the channel is in standard definition, it's only available to viewers who have a "Freeview HD" certified device. Multiplex COM7 has a lower coverage area compared to the original Freeview multiplexes. COM7 is currently being rolled-out across the country and will reach 70% of UK households by June 2014.